As you may have noticed, it's been a while since I've posted any progress on my dollhouse renovation, or what ever happened to Billy since I finished building it. It's on my to-do list, I've just been busy. With what? Well design work, a bit of traveling, trying to acquire a steady paycheck, finishing my website, and working on stuff for my Etsy shop. Not going to blog about the paycheck thing, but I will tell you that there will be some new stuff showing up on Etsy soon. I already posted a couple new things...last month, but I'd like to have more to offer. Don't worry, I'll announce when everything's dry/sculpted/glued/sewn and available for sale. 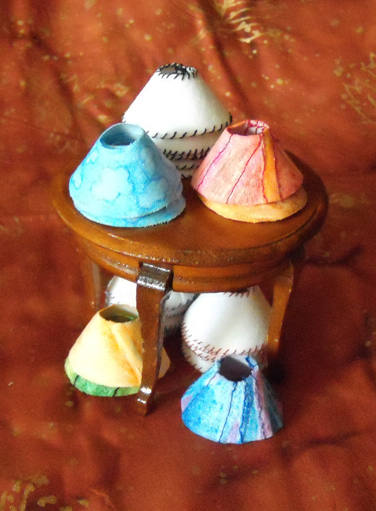 Anyways, because blog posts with pictures are more fun, look I made a bunch of tiny lamp shades. Now I'm going to make a bunch of tiny lamps! 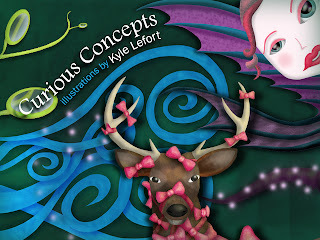 I'm also trying to work out international shipping, because I feel like I'm excluding people who enjoy my work, by only shipping U.S. And that's pretty dumb, I think. ...Back to work I go! Mi español es terrible, pero entendí tus elogios.